If I had read this book four years ago, I don’t know if I would have had the same reaction to it as I’m having now. I was still on the cusp of figuring out what I was going to be feeding myself after eating with solely Indian ingredients until then. I was a brand new immigrant, confused at all the options at grocery store and desperate for chicken with bones and vegetables I didn’t have to bag individually each time I picked them out. I was more insecure, easily led by trends and irritated by them deep down inside. I was doubtful of my ability to cook myself three meals while I waited in an apartment for my greencard and the subsequent opportunity to work it would come with. I was depressed. I used to be a journalist before the move. I wrote, edited stories by other reporters, designed page layouts and I had friends I could meet and speak the colloquial English I grew up with. I wanted to feel whole again. In the middle of it all, it was these same grocery stores that became a sort of refuge for me. Cooking was something I had to look forward to regardless and ticking off items on a grocery list felt like I was accomplishing something again. I looked through blogs and learnt names of famous home cooks I had never heard even a year earlier. I could draw the line of familiarity at Martha Stewart. I didn’t see what I was doing as a privilege at the time. I was simply trying to save myself. This learning curve never led to an obsession with food. It was always a form of sustenance for me. I was thrilled to have new ingredients and at the heart of it all, I still sought the familiar. I imagined how things smelt and the relived the small tasks I did whenever I helped my parents cook. Recreating this food felt like a little celebration each time. Despite the distance, food kept me close to them. All the small victories I had in my own kitchen until just yesterday when I trussed my third roast chicken without YouTube, are directly related to the love I have for this book, Small Victories by Julia Turshen. Even as I notice my growth as a home cook, there are so many things I feel silly about not knowing when I look at the work of others. Insecurity is real and despite a million conversations on how to quiet it down, it still pops up every now and then. I read this book like a novel when I bought it on my e-reader (don’t EVER do this, unless you are trying to save some money. I was impatient). Finally I felt comfortable being who I was and all that I taught myself. I saw myself in every page, in the words she said. Reading the introduction to Small Victories reminded me of a cooking conversation I had just a few weeks earlier with a woman I knew in college but never spoke to because we were both shy. Small Victories is the “We Are Enough” of cookbooks. It has brilliantly written recipes and spin offs for each one, making for endless inspiration no matter what your skill level is. The ingredients used are kept to a minimal making it one of the few books I don’t hesitate to recommend to my friends and family in India. Perhaps the best part of it all is in the end – a list of national (USA), international and local New York non-profits and organisations you can make donations to that actively fight hunger and champion for social justice through food. “I firmly believe that if you have the privilege of eating however much you want whenever you want, you should spend some time ensuring that other have the same opportunity,” Julia writes in the “Give Back” section of her book. I found myself fist in the air, tears in my eyes that someone wrote a cookbook and put every single part of her heart in it. I am simply glad that the first I heard of Julia is through her own words, in her own book (she is an accomplished cookbook writer who is modest about it). All this put together means I have little to compare Small Victories to. All I know is how it made me feel. I was encouraged, comforted and engaged. I felt lucky that I was able to have the skills and means to put meals together the way she described them and it had me dreaming of bigger possibilities for myself in this conversation around social justice. Few cookbooks I own have asked for my heart in this way. If I ever wrote a cookbook (never say never, right?) I would hope it would be at least as half as empowering as this one. Every time someone tells me they can’t cook, I am going to present this book as a solution. It’s true I might have been a little more stumble- y cooking from this book four years ago. But I know I would have been better for it. If you can’t buy the book for whatever reason and you’re in the US, please check out your nearest library or borrow it from me. If neither is an option for you, email me and I can ship you the one I was going to buy myself. 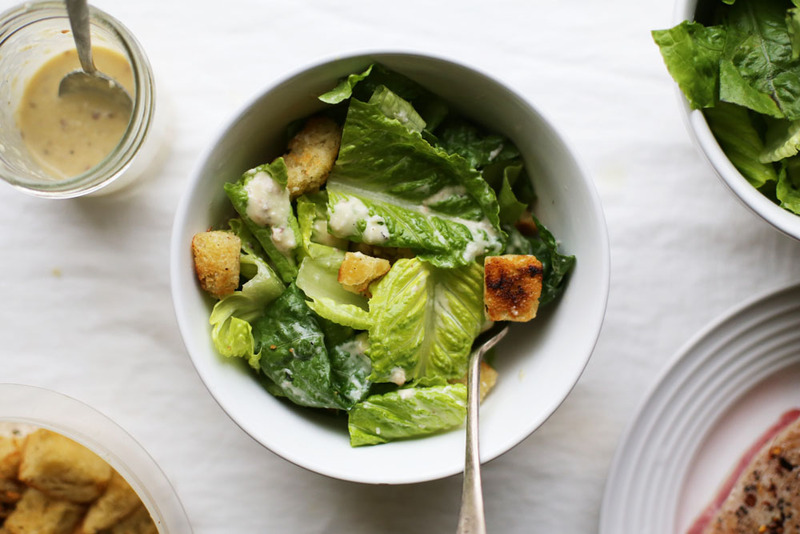 I made the raw egg Caesar salad dressing only once after seeing it in Bon Appetit. I thought I had chanced up the most delicious thing ever. 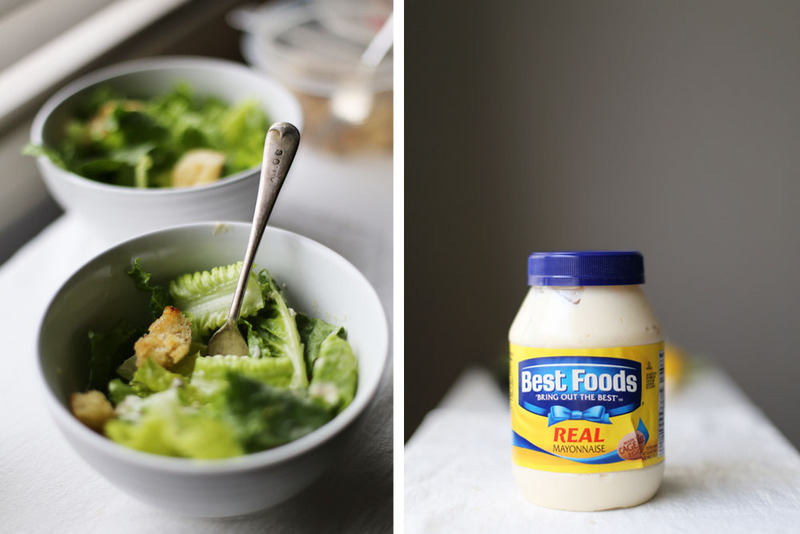 This dressing took all the fuss of a raw egg out of the recipe and handed it over to mayonnaise. Mayonnaise is the condiment second only to sauce (what Indians call ketchup) in my parents home in Goa. I remember eating mayonnaise for the first time in the 90s when it was bottled by a company called Sil and sold in the corner shop. Mind-blown. I chide my parents a lot for eating it these days (adult child syndrome) but HOW CAN YOU NOT. I don’t think I can be the same person after this recipe. This small victory is really a big victory for me. In place of the cherry tomatoes in the original recipe, I made my dad’s world-famous soup croutons. Lots of butter and stale bread to soak it all up. Also note that Julia’s recipe in her book has spin offs for making this dressing vegetarian (1 tbsp drained capers instead of anchovies) or vegan (Vegan mayonnaise, 1 tbsp capers and no Parmesan). The recipe instructions for making this without a food processor or blender are not in the book but written from experience and laziness. 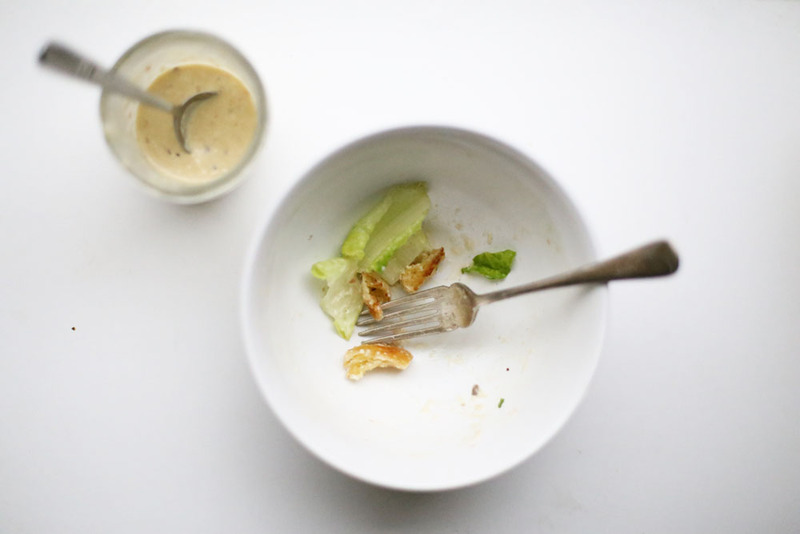 Put the lettuce in a large bowl and drizzle nearly all of the dressing over it. 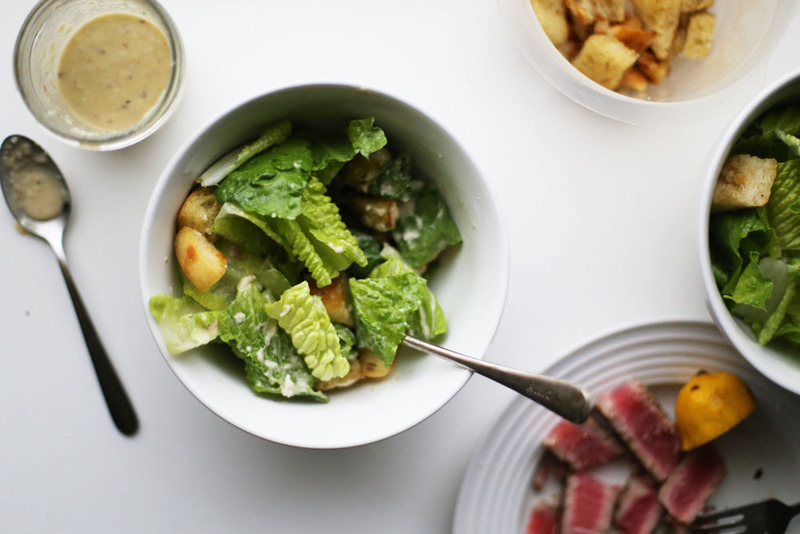 Use your hands to mix everything together, making sure each and every piece of lettuce is coated with dressing. Divide the dressed lettuce among four plates. Divide the tomatoes evenly among the salads and drizzle the last bit of dressing over the salads. Serve immediately. Grate the garlic on a microplane zester and set aside. If you don’t have a microplane (which frankly, I didn’t either until I realised I was hoarding too many lemon peels in my freezer), mince the garlic as fine as you can and then smash it with the back of your knife. Adding a pinch of salt as you smash down the garlic will act as an abrasive and it turn into a paste quicker as another dressing recipe in the Small Victories cookbook demonstrates. Chop the anchovies into tiny pieces and using the back of the knife, flatten them as you chop to turn them into a paste. Don’t worry if it isn’t entirely smooth. 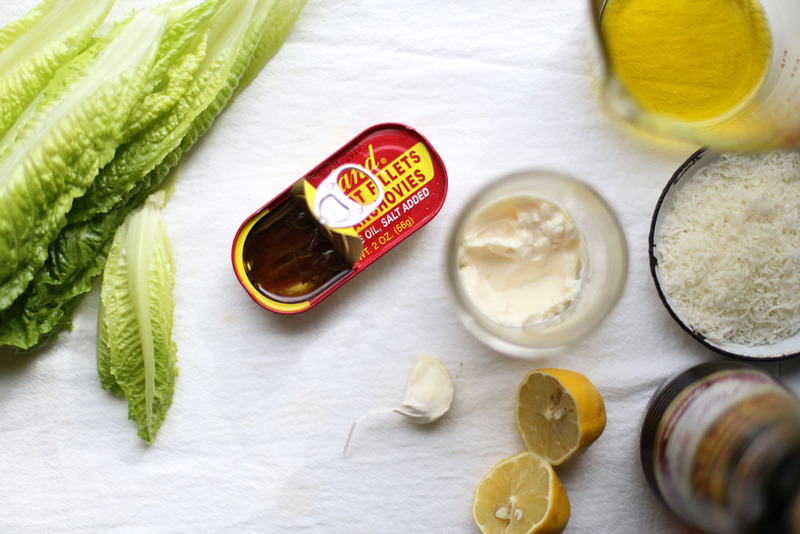 In a small bowl, whisk together the lemon juice, red wine vinegar and olive oil. Add the mayonnaise to the bowl and whisk until combined. Add in the garlic and anchovies along with the Parmesan and whisk enough to help it turn into one creamy dressing for everything. Taste for salt and add more if required. Add pepper – how much depends on how spicy you like it. Melt the butter in a skillet on medium heat and add the bread to it. Stir to let it absorb the butter it’s cooking in and then stir occasionally until it crisps up and turns a deep brown colour. This should take about 5-7 minutes. You can also substitute the butter with olive oil. I sometimes add minced garlic to the bread right at the end. It’s all perfectly acceptable. We had this last night and I agree. Pretty much the best ever. The croutons sound like a genius, delicious addition. This book is pretty special. Thank you, Ben! I just got to looking through your website and I am a big fan of your cook reviews. I was pretty sad to see Eat What You Love wasn’t a favourite for you but I might borrow it from my library anyway.